Racism continues to tarnish the beautiful game across the globe. Throughout the season, SRtRC covered some of the major stories in football worldwide. Over 21 incidents were featured on our website over the season, and many more reports were received by the campaign at lower levels of the game. They are a reminder that the work Show Racism the Red Card delivers is as important and needed as ever. Football is a great tool to challenge racism both within football and in society. While there are many people willing to stand up against racism, there remains a minority that continue to air racist views and exhibit racist behaviours. Education remains the key ingredient to tackling attitudes in society but more needs to be done by authorities to ensure these incidents do not keep occurring in football. Below we take a look over the last season’s key incidents in football. The season started with racism occurring off the pitch with Papiss Demba Cisse receiving racist abuse on Facebook from EDL supporters this led to Northumbria Police investigating the comments. In May 2013 UEFA introduced a 10 game ban for any players found guilty of racist abuse, many football associations signed up to the new rules. During the same month Gaetano Iannini, who plays for fifth-division Matera, was handed a lengthy suspension by the Italian football league for "directing an insult of racial discrimination at an opponent. Gaetano was one of the first players to be hit with new more stringent sanctions since the Italian anti-discrimination rules were introduced in June. Shortly after in July 2013, Racism appeared on the pitch during AC Milan’s pre-season tournament match against fellow Serie A side Sassuolo. On this occasion AC Milan's Kevin Constant walked off pitch after receiving racist abuse emulating Kevin-Prince Boateng's action the previous January. The first incidents in the UK took place in matches involving Port Vale V Bradford and Newport County V Bristol Rovers. Port Vale FC launched an investigation into alleged racist chanting from a section of fans at their home game against Bradford City. While reports of racist chanting by Bristol Rovers fans were made after their game against Newport County. In September, Arsenal teenager Jack Jebb was banned for four games for racially abusing an opponent during a Premier League Under-18 clash with Norwich that took place last March. Jebb, a former England Under-16 and Under-17 international, escaped the FA's new minimum five-match ban for any kind of discriminatory abuse because the Norwich match took place last season. In October racism hit the Champions League. Yaya Toure was subjected to racism from CSKA Moscow supporters during Manchester City’s group match. UEFA later ordered that Russian side CSKA Moscow partially close their stadium for the following match in the competition. In November UEFA took a U-Turn on a Sectarian Incident to investigate an incident involving Ajax where a Sectarian banner which read "F***ian Ba****s” was unveiled by supporters in their game against Celtic. Later in November, FIFA president Sepp Blatter criticised Real Betis supporters after they appeared to make racist gestures towards one of their own players. The incident occurred after Betis defender Paulao was sent off during his sides 4-0 derby defeat by Sevilla. The referee did not mention the episode in his match report. In December Police probed claims that a 'minority of Boro fans' ripped up copies of the Qu’ran at Birmingham City. The club vowed to ban for life anyone convicted concerning alleged behaviour. The club confirmed that two fans had been suspended from matches. Later a fan was taken to court and fined £235, but did not incur a football banning order. In January supporters continued to make headlines with a Swansea City FC supporter admitting making a racist gesture towards a Newcastle United player during a game at the Liberty Stadium. In the same month a Man was jailed for 6 months for sending racist tweets to Maurice Edu and Kyle Bartley which had taken place after a game at St Johnstone on 14 January 2012. Further on in January former Nottingham Forest, Aston Villa and Liverpool striker and Talk SPORT pundit Stan Collymore once again spoke out about the racist abuse he was receiving on Twitter. In August 2011, a 21 year old man was arrested by Northumbria Police following reports of racist tweets sent to Mr Collymore. Collymore continued to face racist tweets throughout the season. In February Brazilian full-back Marcello was subjected to monkey chanting by a minority of Atletico fans during the warm down following the Madrid derby. Later in February, in Wales a youth player was racially abused in an under-19s game in Flintshire and was further investigated by the Football Association of Wales. The player was later given a 12 match suspension. The player was later released from his contract at the club. In March a teenager who racially abused an East Stirlingshire player at Peterhead's Balmoor Stadium was been given a one-year football banning order and a £300 fine. In April Dani Alves had a banana thrown at him during the Villarreal v Barcelona match in Spain. Alves reacted to having a banana thrown at him during Sunday's dramatic 3-2 win at Villarreal by peeling it and then taking a bite. The incident sparked support on social media channels against the actions of the individual Villarreal gave the fan responsible a life ban. Villarreal were later fined 12,000 Euros for the actions of the individuals. This month (May) has seen Atletico Madrid fans accused of racist chants by Levante's Diop. 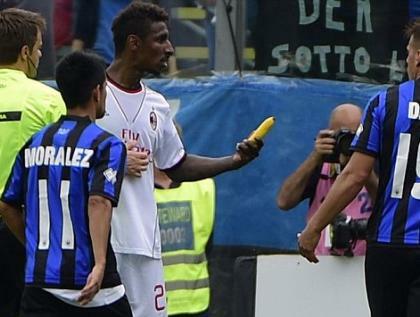 AC Milan players faced racist abuse in a league match at Atalanta where Bananas were thrown on to the pitch during a Serie A game. Following the incident Atalanta have been fined by the Italian league 40,000 Euros. Though this sanction is reported to have suspended for one year and will only take place if the Nerazzurri reoffend. The actions at the Stadio Atleti Azzurri d'Italia, were the third in as many weeks across Europe's top flight. The latest incident saw Mario Balotelli suffer alleged racial abuse on international duty. The striker was the subject of chanting from a group of men outside Italy's training headquarters in Coverciano, Florence. Local police intervened to allow Italy's training session to continue. The campaign hopes that this is not a sign of what is to come during the World Cup this summer. These incidents further highlight that racism is far from being eradicated in football. It is important that everyone involved in football continues to challenge and report racism at all levels to ensure that those who are willing to subject others to racist abuse are dealt with and that a strong message is continually sent out against racism. If we can achieve this in football it will go a long way to challenging racism in society and setting a good example for our young generation that this should not take place beyond 2014.